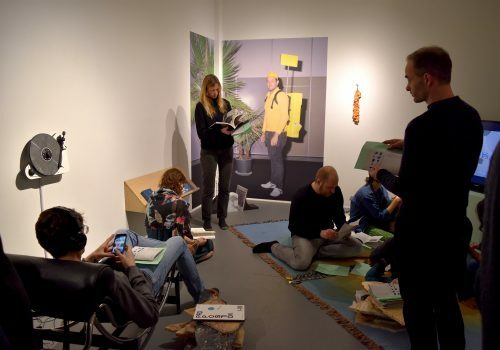 Join us for a walkthrough and closing reception of the critically acclaimed, and Artforum Critics’ Picks exhibition Richard Ibghy & Marilou Lemmens: Measures of Inequity, with artists Richard Ibghy & Marilou Lemmens and curator Kari Conte. Measures of Inequity features a series of sculptures that give material form to the abstract diagrams used to map the unequal distribution of wealth. Richard Ibghy & Marilou Lemmens are interested in forms of thought–ways of reasoning, systems of classification and the measurement of socioeconomic status–and how these forms create, adopt and reproduce knowledge. 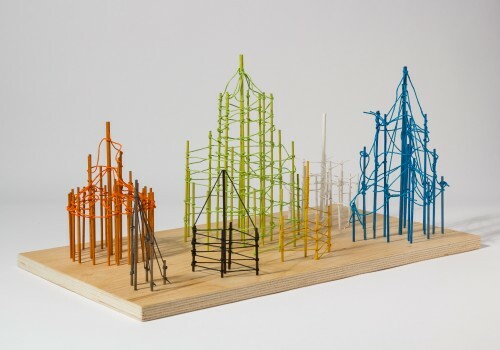 The exhibition includes more than twenty geometric sculptures built from everyday materials including string, wooden sticks and colored plastic; their handwritten titles reflect the data they are based on such as Income Inequality in the United States 1910-2010; Class, Cultural Capital and Social Reproduction and Disparities in Access to Care for Selected Groups. Melding historical information with future speculation, the exhibition breaks down complex data into intuitively readable objects, challenging the way that information is constructed. Richard Ibghy & Marilou Lemmens’ work has been shown at the 14th Istanbul Biennial SALTWATER: A Theory of Thought Forms, 2015; La Biennale de Montréal, L’avenir (looking forward), 2014; 27th Images Festival, Toronto, 2014; Manif d’art 7: Quebec City Biennial, 2014; La Filature, Scène Nationale, Mulhouse, France, 2013-14. 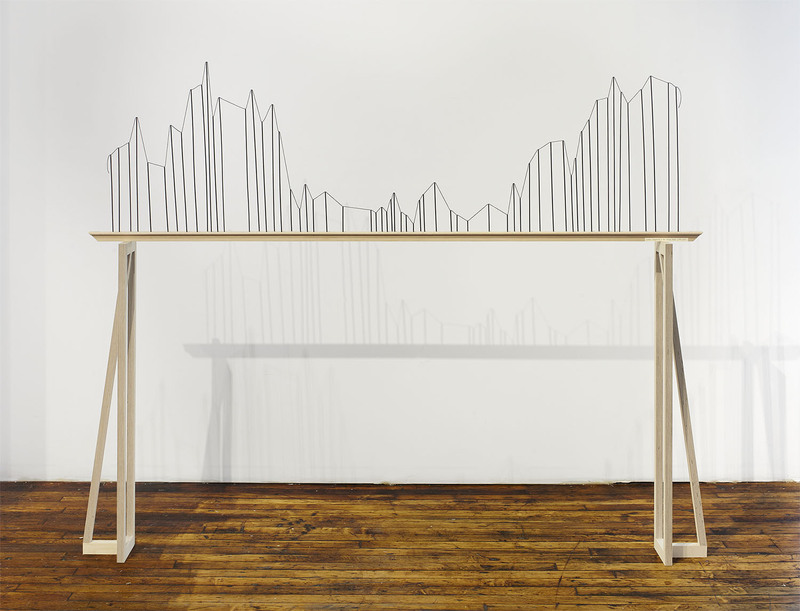 Richard Ibghy & Marilou Lemmens, Income Inequality in the United States (1910-2010), 2016, Wood, ink and string, 74 × 20 × 11/4 in. (187.96 × 50.8 × 3.17 cm). Photo by Martin Parsekian. 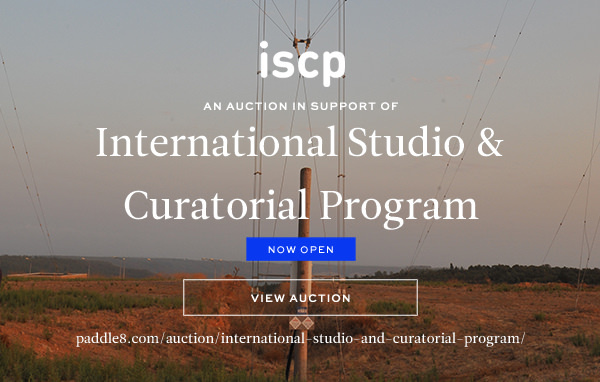 The International Studio & Curatorial Program is excited to announce the 2016 ISCP Benefit Auction and a new limited edition by Cary Leibowitz. Conducted exclusively online through Paddle8, the auction offers a wide range of affordable contemporary art works by established and mid-career artists. Twenty-six ISCP alumni and international contemporary artists are supporting ISCP by donating all of the auction proceeds. The funds raised will support the program, and pay to bring artists and curators from areas of the world that do not have significant cultural infrastructural funding. 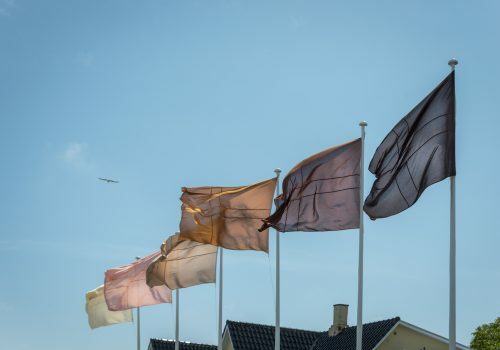 Participating artists include: Clytie Alexander, Lotte Van den Audenaeren, Itziar Barrio, Ghost of a Dream, Shepard Fairey, Fiona Foley, Theaster Gates, Gabriela Galván, Laura F. Gibellini, Martine Gutierrez, Corin Hewitt, Pablo Jansana, Kirsten Justesen, Anouk Kruithof, Paul Laffoley, Cary Leibowitz, Pepe Mar, Bastian Muhr, Kate Newby, Maria D. Rapicavoli, Ward Shelley, Amie Siegel, Gabriel Specter, Donald Sultan, Tang-Wei Hsu, and Martha Wilson. Generous donations to the auction have been made by the artists as well as Douglas Walla & Kent Fine Art, Ryan Lee Gallery, Simon Preston Gallery, P.P.O.W. 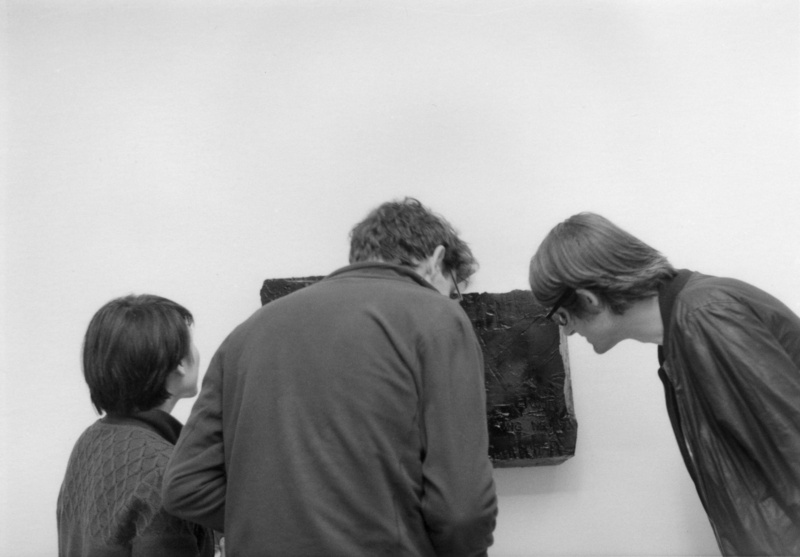 Gallery, and Luhring Augustine Gallery. We also thank Ackerman, Catskill Distilling Company, Lagunitas Brewing Company, and Warsteiner for their sponsorship of this event. Maria Rapicavoli, HF (3-30 MHz), (detail), 2013, Chromogenic print, 25 × 37 in. (63.5 × 93.98 cm). Courtesy of the artist. 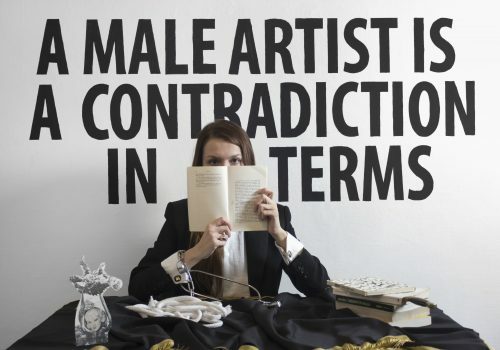 Martine Gutierrez, Suits, 2014, Archival inkjet print on Arches Baryta, mounted on Sintra, 20 × 30 in. (50.8 × 76.2 cm). Courtesy of the artist and Ryan Lee, New York. 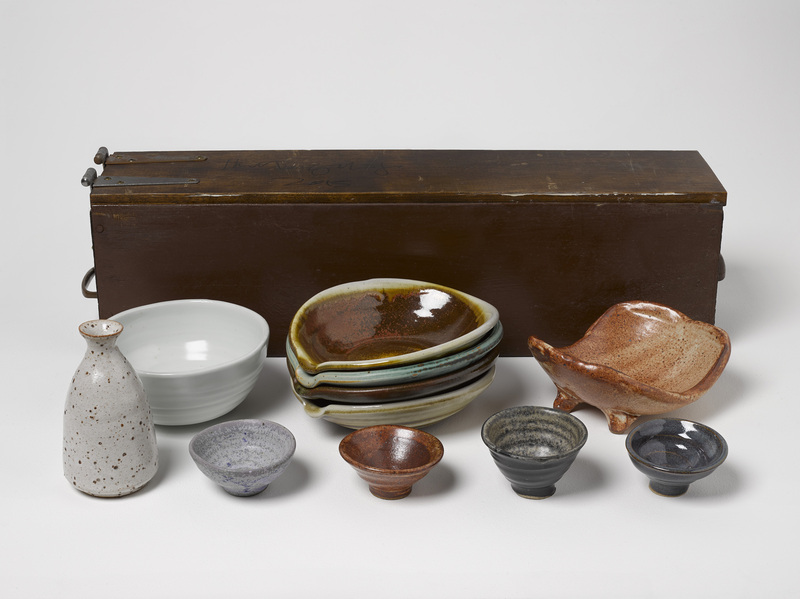 Theaster Gates, Soul Food Starter Kit (for Three and the Invisible), 2016, Glazed ceramic dishes, record album, and sheet of paper in a box, Approximately 15 x 30 x 12 in. Courtesy of the artist. 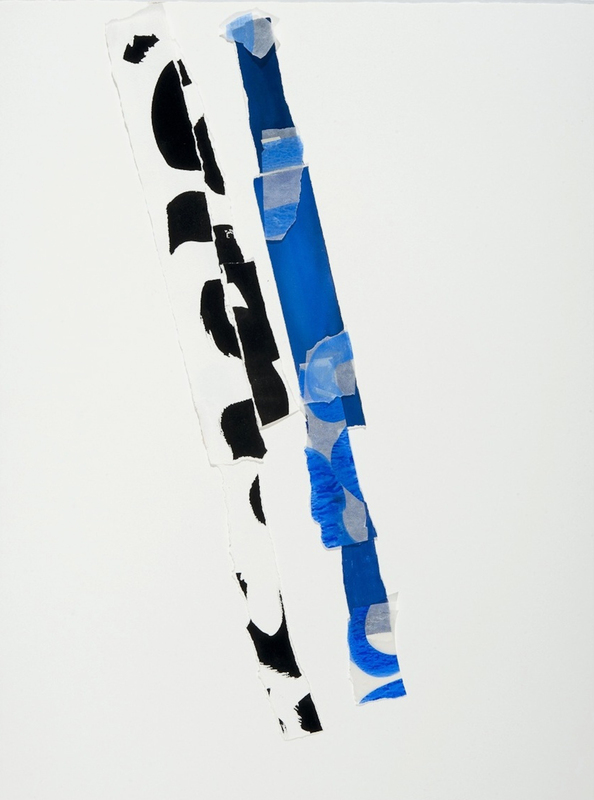 Clytie Alexander, Black Loops 27/Blue, 2015-16, Shellac based ink on papers mounted on Arches wc paper, 30 × 221/2 in. (76.2 × 57.15 cm). Courtesy of the artist. 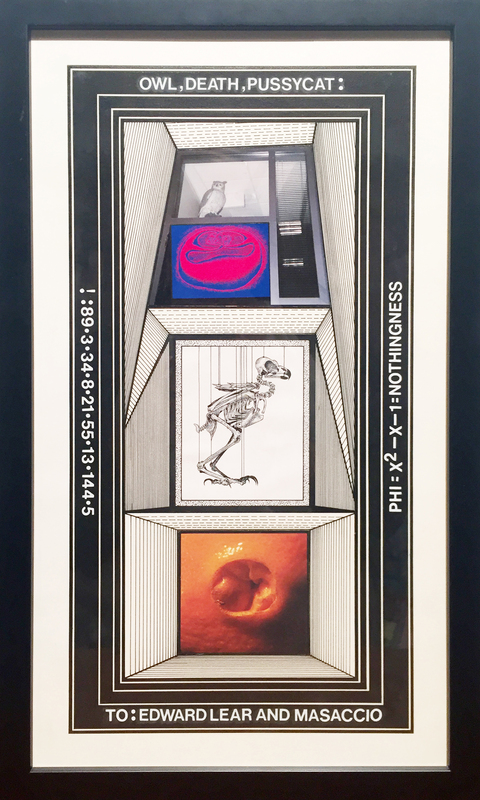 Paul Laffoley, Owl, Death, Pussycat, 2003, Ink, photo collage, and vinyl lettering on board, 171/2 × 10 in. (44.45 × 25.4 cm). Courtesy of The Estate of Paul Laffoley and Kent Fine Art.